Extensive evaluations are underway on the life support systems vital to successful flight tests as NASA prepares to return human spaceflight to the United States. One of the most intensely studied systems is called ECLSS. Short for environmental control and life support system and pronounced 'e-cliss,' the system is a complex network of machinery, pipes, tanks and sensors that work together to provide astronauts with air and other essentials during missions for NASA's Commercial Crew Program to and from the International Space Station. "ECLSS Systems and Subsystems present unique challenges to a developer," said Brian Daniel, Crew Systems lead for the Commercial Crew Program. "Such systems must assure tight control of parameters that are important to human safety such as temperature, carbon dioxide levels, oxygen levels, and cabin pressure. The various functions of the life support system must not only be failure tolerant and robust, but also able to perform their function for the whole gamut of the mission, from countdown to splashdown." "Unlike relying solely on computer simulation and analysis, the ECLSS Module allows us to test and observe Crew Dragon’s life support systems as they autonomously control a real cabin environment," said Nicholas Lima, a life support systems engineer at SpaceX. 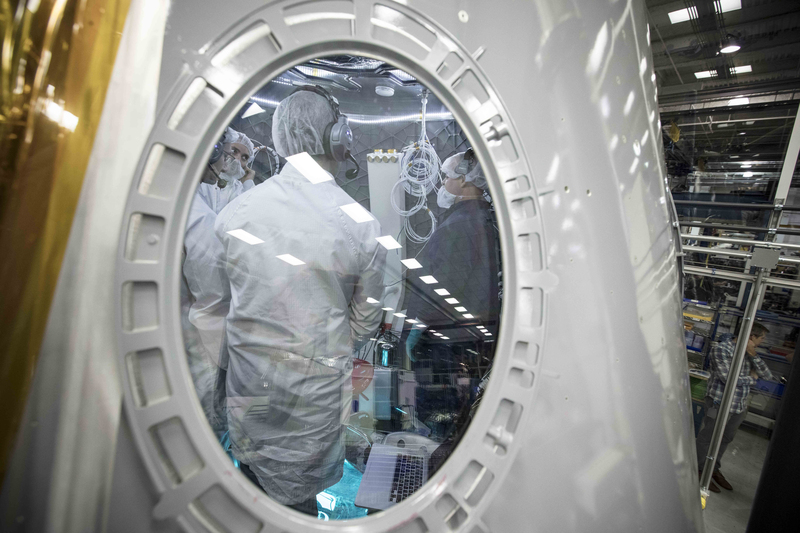 "Extensive testing of the ECLSS module has and will continue to contribute to improvements to Crew Dragon’s design and operation, which ultimately leads to greater crew safety." Crew Dragons will carry astronauts to the International Space Station on missions for NASA's Commercial Crew Program. The spacecraft will fly into orbit atop a Falcon 9 rocket lifting off from Launch Complex 39A at NASA's Kennedy Space Center in Florida. 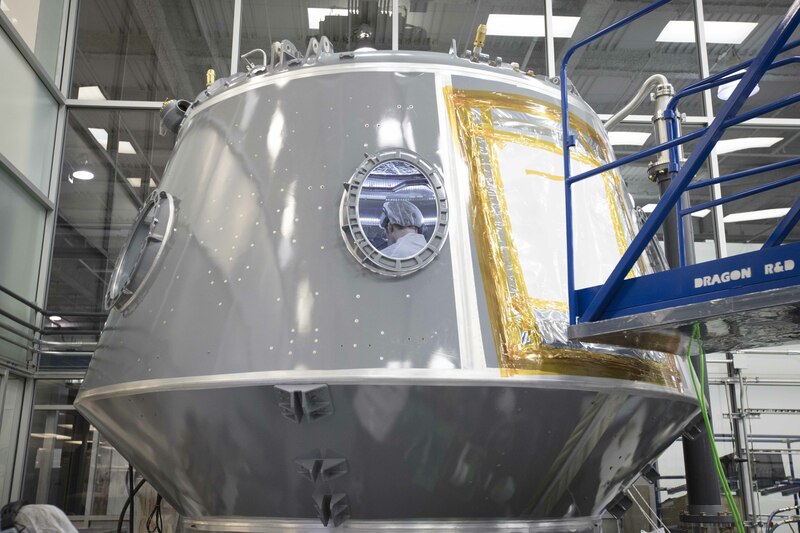 Separately, Boeing is manufacturing a line of spacecraft called CST-100 Starliners that also will take astronauts to the station for on Commercial Crew missions. NASA has awarded contracts to both companies for flight tests and operational crew rotation missions to the station. NASA’s Jet Propulsion Laboratory is helping SpaceX get to Mars and the collaboration could speed up efforts to land humans on the red planet within the next two decades. Through a Space Act Agreement, JPL and NASA are collaborating with SpaceX on landing site selection, mission navigation and mission design in exchange for access to data from the future landing. SpaceX hopes to send the unmanned Red Dragon to Mars in the next four years, though analysts say the proposed time frame seems unlikely. The Hawthorne-based company did not respond to requests for comment. Red Dragon is expected to weigh at least 10 times more than the Mars Curiosity Rover, the one-ton robot that holds the record for being the heaviest man-made object to land successfully on Mars. Curiosity was lowered to the surface by a crane-like spacecraft, but the technology isn’t as viable for heavier payloads. NASA is paying for their employees to work on the SpaceX mission, but the agency doesn’t have to cover any of the costs associated with building and designing a spacecraft. In the end, NASA gets the knowledge gained from such a mission without the risks, said Jason Callahan, a space policy advisor with The Planetary Society in Pasadena. The arrangement isn’t out of the ordinary, though the destination is very new for these types of collaborations. “It’s just an indication of how far along the industry has come in the last 40 years that they can actually be talking about doing a private mission to another planet,” Callahan said. NASA is not sending any scientific instruments along with Red Dragon, a sign the space agency is not confident in SpaceX’s ability to land on the first try, he said. It’s not a jab at SpaceX — landing on Mars is extremely difficult. “I think NASA is absolutely thrilled to have anyone trying to get to Mars. The more people you have working on it, the more likely you are to succeed,” Callahan said. The collaboration aligns with President Donald Trump’s desire for NASA to work more closely with the aerospace industry to create jobs and drive innovation in space. Once NASA has access to the Red Dragon’s data, others in the industry can learn from it too. The partnership is already well underway. JPL and SpaceX are narrowing in on a potential landing site for the Red Dragon. The most promising Martian region is Arcadia Planitia, a smooth plain with close proximity to ice deposits, according to Matt Golombek, a JPL project scientist who has worked on Mars landing site selections since Pathfinder in the 1990s. SpaceX wants to land near ice deposits while staying as close to the equator as possible, Golombek said. Though SpaceX’s first Red mission to Mars is an unmanned technology demonstration, the goal is to land near resources that could prove valuable for future colonization efforts. About four regions fit SpaceX’s criteria, but Arcadia is the most promising because it is mostly flat and rock free, making it an ideal landing zone for the Red Dragon. The capsule would use supersonic retro-propulsion to slow itself down in Mars’ atmosphere and land much like the Falcon 9 does here on Earth. SpaceX on Thursday proved the viability of their re-usable Falcon 9 rocket by re-launching the rocket on a second mission. To make Mars missions cost-effective, SpaceX CEO Elon Musk said Thursday the company would need to be able to immediately refly rockets by the thousands. NASA will use the experience from SpaceX’s mission to improve their selection of landing sites for their own missions to Mars, Golombek said. SpaceX approaches and solves problems in a much different way than NASA, giving both an opportunity to learn from each other.